Get ready to relive the 90s and get a little messy, brewers! 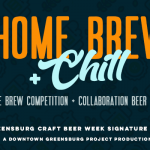 Breweries will go head-to-head by answering craft beer centric questions; competing in slimy, messy physical challenges; and ultimately facing the difficult obstacle course to determine who the Brewers Double Dare champion is! Everyone is encouraged to attend, spectate, and cheer on your favorite brewery!